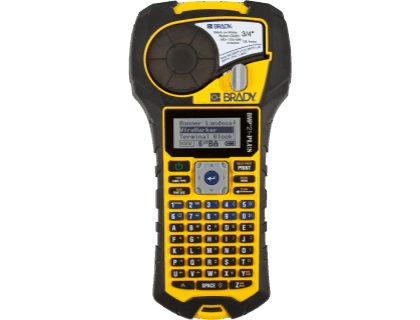 Learn about the Brady BMP 21-PLUS Portable Label Printer. Includes pricing, features, and frequently asked questions. 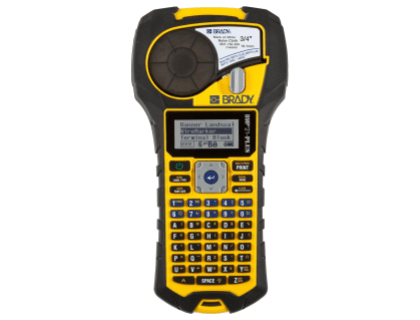 The Brady BMP 21-PLUS Portable Label Printer is a hand-held label printer that creates multi-linel labels for the identification of wires, panels, and other industrial items. Prints in 6 different text sizes in a single color. Reinforced with molded-rubber impact bumpers for durability. On-board keyboard contains letters and numbers. Pros: Durable, portable, no wastage, easy to use. Cons: Depletes batteries fast, only prints 3 lines, one color only. Bottomline: An affordable printer with various formats for printing durable labels. The Brady BMP 21-PLUS Portable Label Printer retails for $99.00. TOUGH on the outside, SMART on the inside. The super rugged, ultra-intelligent BMP®21-PLUS is an affordable label and wire printer designed for the tool box. This handheld label printer creates multi-line labels for clear identification of wires, panels, circuit boards and other industrial items. Compatible with Brady BMP21 Series printer continuous tape cartridges to enable printing of various styles and widths. Drop-tested and reinforced with molded-rubber impact bumpers for durability in the most demanding work environments. Passed shock and vibration testing per MIL-STD-810G Method 5.16.6 S4.6.5. Can I print flag type labels for fiber patch cords? Yes, you can print flag type labels for any diameter cable by specifying the size on the machine. The printer will then work out the total length of the label for you. Does the BMP 21-PLUS Portable Label Printer have a warranty? Yes, the BMP 21-PLUS Portable Label Printer has a 2-year warranty. Where can I buy the BMP 21-PLUS Portable Label Printer? You can buy the BMP 21-PLUS Portable Label Printer by clicking on the link above, or from sites like Megadepot and Amazon. What are some BMP 21-PLUS Portable Label Printer alternatives? Brady BBP 33 Label Printer Kit for Slide Labels. Brady BMP 21-LAB Portable Label Printer. Printek 93184 FieldPro Label Printer w/o Battery. I bought a Brady BMP 21-Plus kit off eBay. It has a setting to do label flags. It works really well. My new boss has been using those zip-tie flags, and I am going to start swapping them out. Those are just asking for my finger tips to be cut up. I've used the Brady BMP-21-PLUS for 7 years or so and love it. I've never had a label fade or peel off. The ink or whatever will rub off if it's in a location where it gets rubbed against all the time, but otherwise they're very durable. I use the Brady BMP-21-PLUS, with self-laminating labels. You can make the text as long as you want, but are limited to lines based on font and tape size. 1” tape will get you two lines, and will self-lam on mic line and narrower Catx, but your text will not be readable from both sides of the wire. For speaker or shielded catx, you’ll need the 1.5” (which will do three lines, and the text will fully wrap on smaller wires). We standardize on the 1.5”.For the tapes, I order them from my local electrical supply (Westburne). The self-lams are never stocked, but regular tapes are. The kit including a case, power supply, and rechargeable battery is ~$250; tapes are $40-50 or so. EDIT: changed the tape sizes; I was incorrect in what we used.